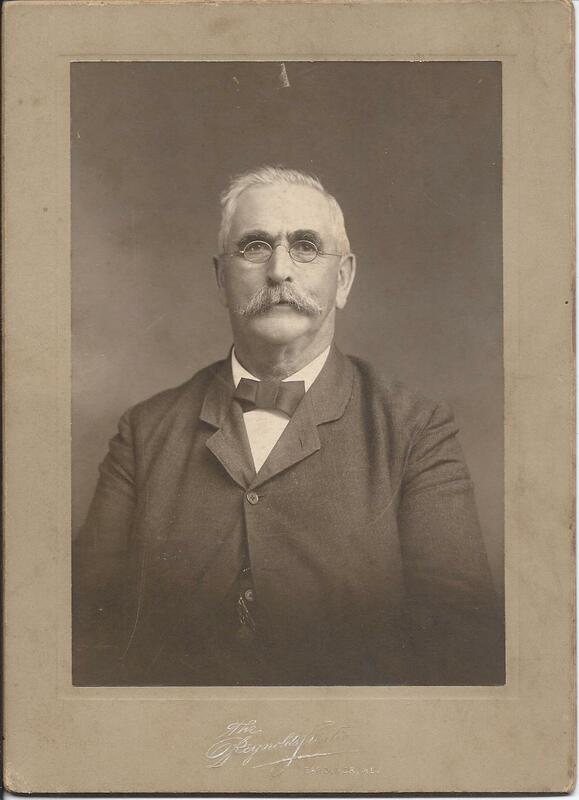 Photograph of an older man identified on reverse as James Morrell Larrabee. The photograph was taken by the Reynolds studio of Gardiner, Maine. The identification also has two dates: 1883 and 1901. James Morrell Larrabee lived to 1910, so 1901 was likely the year the photograph was taken. 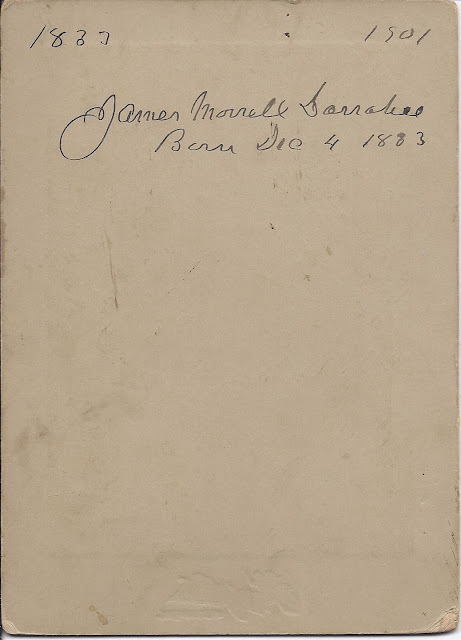 James Morrell Larrabee was born 4 December 1833 at Wales, Maine, the son of Daniel and Sabrina (Ricker) Larrabee, born at Wales, Maine, and Milton, New Hampshire, respectively. His paternal grandparents were John and Susanna (Andrews) Larrabee. His maternal grandparents were Elias and Mary Morrell (Wetherell) Ricker. On 18 September 1856, James Morrell Larrabee married Priscilla Woodward, daughter of Amos and Nancy Woodward of Winthrop, Maine. It's possible that Nancy's maiden name was Muzzy, but any record I found of the children of Amos and Nancy (Muzzy) Woodward did not include a Priscilla. If Priscilla was the daughter of Amos and Nancy (Muzzy) Woodward, she had a brother, Amos Walton Woodward, who moved to Illinois and founded the Woodward Governor Company. The couple raised a family of six children at Gardiner, Maine, where James Morrell Larrabee worked in education, in farming, at carpentry and, finally, as a Judge. 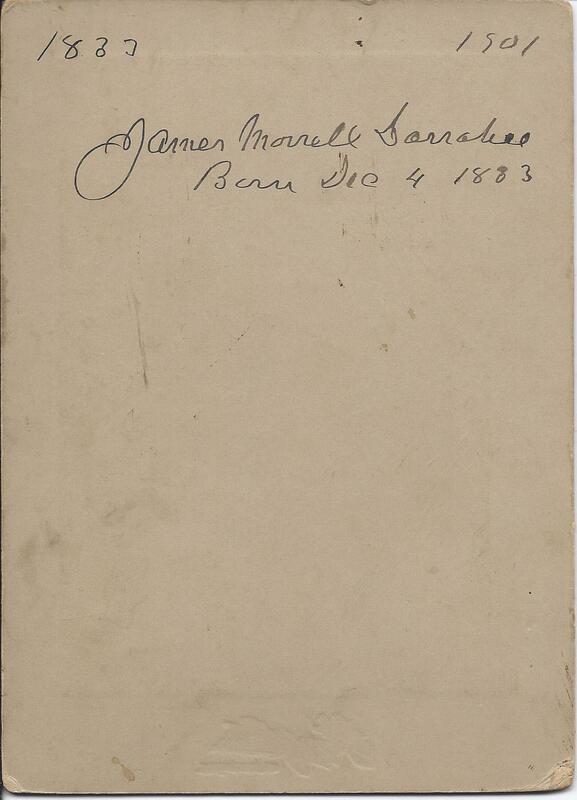 Read a short biography of the life of James Morrell Larrabee here, in the Biographical Sketches of Representative Citizens of the State of Maine, 1903, which contains an exact copy of the photograph shown above. James M. Larrabee was my grandmother's grandfather. Her father was Harry Larrabee. Harry had two daughters, Eva Maud Larrabee, my grandmother, and Lula Belle Larrabee. (not sure of spelling) My grandmother's mother, Lizzie, died when my grandmother was a young girl. Her father remarried, and my grandmother's stepmother was named Lena. Thank you for taking the time to comment and adding this extra information. I hope you got a kick out of seeing this photograph of your great great grandfather! I'm wondering if that's his own handwriting on the reverse. Perhaps you have something to compare it with. I did enjoy seeing this photo! Thank you for posting it. I do have a sample of his writing. I have a diary of his that he wrote beginning in 1855. I was just reading from it this morning. It is amazing. the writing on back of the photo does not look like his in the diary. I also have many family photos and other things. I was wondering if I ought to make a blog on here and enter his diary. This site is new to me. Do you have any suggestions? Ah, so the handwriting must belong to a relative or other recipient of the photograph. As to putting the contents of his diary online, yes, that would be fantastic and a real service on your part! I use Blogger, a Google product (free), but there are others. It's fairly simple, but I'm down to a routine that doesn't use a lot of bells and whistles.